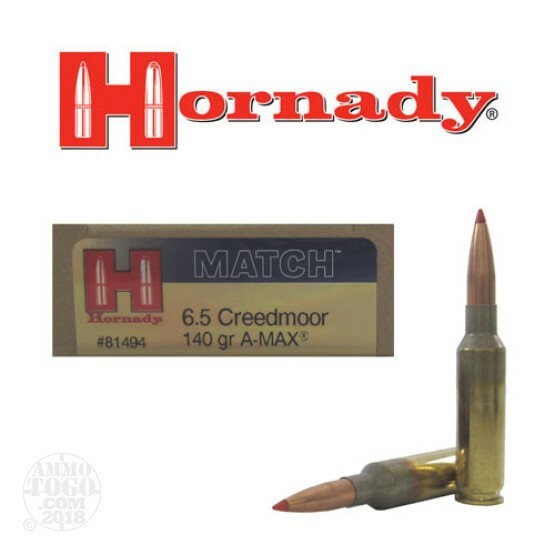 This is 6.5 Creedmoor Hornady Match 140gr. A-MAX Ammo. This ammunition is custom-grade from the factory, loaded to stringent specifications to guarantee proper ignition and provide consistent, match-winning, pinpoint accuracy, shot after shot. With a muzzle velocity of 2710 fps and an energy of 2283 ft lbs, it performs as well or better than handloads. This ammunition is new production, non-corrosive, in boxer primed, reloadable brass cases. This ammo comes packed in 20rd. boxes.